(Photo by Curtis Johnson) The a capella octet Cantus will take an introspective look at what it means to connect in our modern world. Cantus has been called “the premier men’s vocal ensemble in the United States” (Fanfare). The a capella octet will make its second appearance at Penn State when it performs Alone Together, an introspective look at what it means to connect in our modern world, September 25 at University Park’s Pasquerilla Spiritual Center. The ability to communicate has never been easier or faster. But as technology makes the planet feel as though it’s smaller, the divisions between nations, communities, and relationships seem to be widening. Alone Together will explore the struggle to build meaningful connections in a world that has never been more connected. A highlight of the concert is the world premiere of a multi-movement piece – co-commissioned by the Center for the Performing Arts at Penn State through its membership in the Music Accord consortium – composed by Grammy Award winner Libby Larsen. A Delaware native, Larsen is one of America’s most performed living composers. She has created more than 500 compositions in various genres, including vocal and chamber music, orchestral works, and operas. Her music is included on more than 50 albums. In addition, the program includes songs by Jennifer Higdon, William Grant Still, Halsey Stevens, Simon and Garfunkel, Dave Matthews, Ludwig van Beethoven, Lennon/McCartney, Pentatonix, Elder Joseph Brackett (arranged by Stephen Caracciolo), Leonard Bernstein, and Gabriel Kahane. One of America’s few full-time men’s ensembles, Cantus, which last performed at the university in 2014, is known worldwide for its trademark warmth, exceptional vocal blend, and engaging performances of music from the Renaissance to the 21st century. 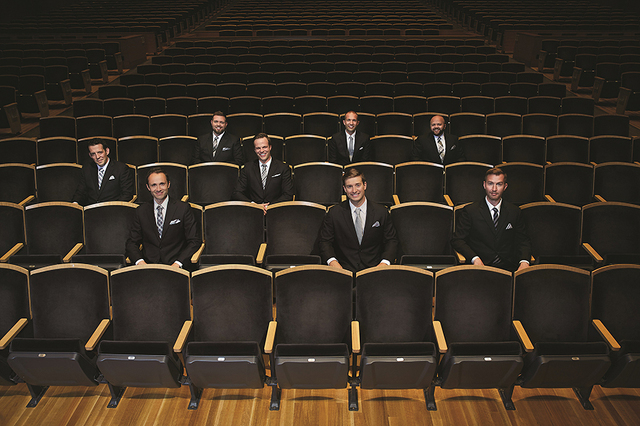 Cantus, based in Minneapolis-St. Paul, Minnesota, is unusual for not having a music director. The members rehearse and perform as chamber musicians, each contributing to the entirety of the artistic process. For tickets or information, go to cpa.psu.edu or phone (814) 863-0255.